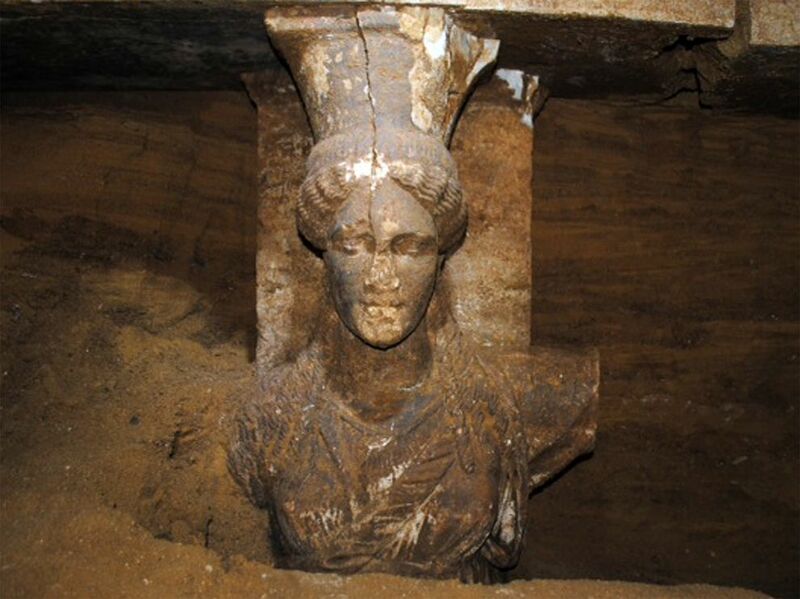 The excavation is still on at the Amphipolis Kasta tomb in northern Greece. After the discovery of two sphinxes, two caryatids (female statues) have now been found in the second part of the tomb. The statues are well preserved with only one in the eastern side missing their face. The statues are said to have been built to ward off any entrants further into the tomb. Traces of red and blue colours have been found on the caryatids, symbolic of female statues of the time. The tomb is dated between 325 and 300 BC, which sparks some interest regarding Alexander the Great, who died in 323 BC. However, this claim is being disputed seeing as the great leader of the time died in Babylon. But, whoever is buried here was obviously of some importance, perhaps even royalty. The size of the tomb, the sphinxes, a beautiful mosaic floor (with colours symbolic of royalty) and now the caryatids have archaeologists super duper excited about the tomb’s owner. ← First Neanderthal rock art found?